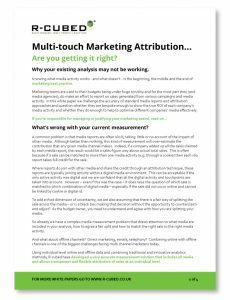 Multi-touch Marketing Attribution - Are you getting it right? Multi-touch Marketing Attribution – Are you getting it right? Knowing what media activity works – and what doesn’t – is the beginning, the middle and the end of marketing best practice. But is your attribution model really showing you the full picture? In this white paper we challenge the accuracy of standard media reports and attribution approaches and question whether they are bespoke enough to show the true ROI of each company’s media activity. Unless it’s truly channel-agnostic and able to pull both online and offline channels, your attribution model may be fatally flawed.